Gabon coach Daniel Cousin settled his wage dispute with his country's sport ministry after formally signing a contract to take charge of the Panthers until the end of this year's Africa Cup of Nations campaign. Cousin had been working without a written contract since his appointment as Gabon coach in September last year, with local media reporting he had not received a salary. 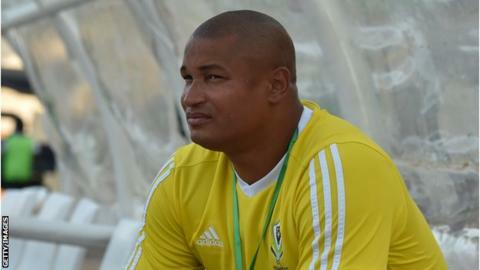 The new deal gives 42-year-old Cousin security as he aims to qualify the team for the 2019 Nations Cup in Egypt. "February 28, 2019 marked the official signing ceremony of Daniel Cousin's contract as coach of the Panthers of Gabon," Gabon's football federation (Fegafoot) said in a statement. The ceremony took place at Fegafoot's headquarters in the presence of the Gabon Sport Minister Alain Claude Billie By Nze and Fegafoot President Pierre Alain Mounguenhui. Fegafoot say Cousin's assistant coach Mbanangoye Zita Bruno and the national team's general manager François Amegasse "will also sign their respective contracts in the coming days." The formalisation of Cousin as Gabon coach comes as they prepare for their final 2019 Africa Cup of Nations qualifier against Burundi in Bujumbura on 23 March. Gabon must beat Burundi to qualify for the finals in Egypt. The Panthers are third in group C with seven points, two points behind Burundi who just need a draw to reach their first ever Nations Cup. Group leaders Mali have already qualified. Cousin, a former Gabon international who played for several clubs including Scottish giants Rangers and Hull City, has been in charge of three Nations Cup matches with Gabon since he took over as coach. He has recorded two wins against South Sudan - home and away - and lost to Mali at home.